Facebook is testing a new "downvote" button that will let people hide comments and provide feedback about them. 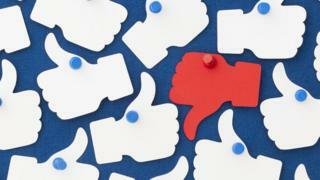 However, the social network denied that the new feature was a "dislike" button, which many Facebook users have requested. The downvote button is being tried out by a small number of US users. The company also announced a number of other measures aimed at improving the Facebook community. The social network confirmed the test to news site Tech Crunch. "We are exploring a feature for people to give us feedback about comments on public page posts. This is running for a small set of people in the US only," the company said in a statement. Other social sites such as Reddit have a "downvote" option that reduces the visibility of unpopular posts. When Facebook's downvote button is clicked, the selected comment is hidden. People can then decide whether to flag a post as "offensive", "misleading" or "off-topic". However, it does not affect the visibility of the post for other people and does not affect its ranking in the news feed. Martin Garner, tech analyst at CCS Insight, said the button appeared to be part of Facebook's continued resistance to labelling itself a publisher. "It has become very clear that Mark Zuckerberg doesn't want Facebook to have the responsibility of identifying what is offensive or misleading - and what is not - because that would put him into the position of being a publisher rather than a platform," he said. "He doesn't want to do that as it takes the business in a different direction - so he is leaning on the community to do it. "It is an open question as to whether that's the right answer or not but that's where this fits in." On Friday, the company also announced it would double the number of engineers it employs in London to develop solutions to the problems Facebook faces. It declined to share how many additional engineers it was hiring, but said the move was an investment to "remove bad content from the platform". "Whether it's scamming, bullying, harassment or false news, they will work with experts to understand the issue, identify the pattern and build a solution," said Facebook's Chris Cox. It also announced a $10million (£7m) fund that it will give away to community groups in a bid to tackle political "polarisation". "Non-political communities such as churches, sports groups, parenting groups, dog walkers - these are the natural antidote to polarisation," said Mr Cox. "One of the best things we can do is help people meet others who aren't like them. Groups are most effective when they bring people together offline. They're a chance for people to bond over something they do share." Facebook Groups will be able to apply for a slice of the fund. Five community leaders will be given $1m (or about £715,000 in the UK) to further their causes. Up to 100 additional groups will receive up to $50,000 (or £35,000 in the UK). "We're looking for big impact ideas that bring people together," said Mr Cox.